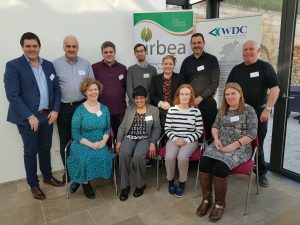 IrBEA and the Western Development Commissions are Irish Partners on the Interreg EU REDIRECT project. Sean Finan and Teresa O’Brien from IrBEA had 3 productive days in Baden-Baden last week, a partners meeting took place on the Monday where all partners reported on developments and work done under the RE-DIRECT project in their jurisdiction. 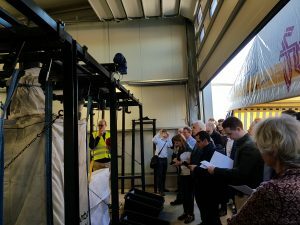 On the second day 80 participants including several Irish companies visited a Pyreg plant in Baden-Baden – Eigenbetrieb Umwelttechnik. This plant has heat contracts with municipal consumers of bioenergy and biofuels with public buildings such as schools and libraries. The partner is responsible for the treatment of organic waste and the waste water treatment of the city of Baden-Baden. This plant acts as a depot for the delivery of all organic waste and storage for the town. In this facility pre-treated green waste – timber, chip, roadside cuttings, manure, and garden waste from the surrounding municipality is processed using IFBB technology, the technology is aimed to develop an environmentally-friendly biofuel production by using green cuttings and waste water. It’s a working model of a circular economy by focusing on utilising abandoned urban, natural and agricultural areas for biomass and by being processed produces fuel, electricity, heat and biochar for water filtration. with reactor in the background. 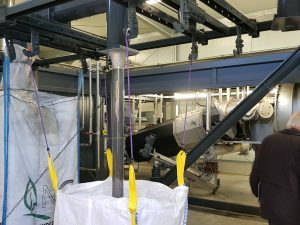 The German partners – Eigenbetrieb Umwelttechnik have successful built this biochar plant with the support of EU Interreg projects like COMBINE and now RE-DIRECT, delegates last week had a chance to see this plant up and running with an engineer talking through the processes at work. The goal of the RE-DIRECT project is to convert 20.000t of unused biomass into carbon products. 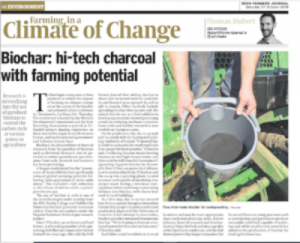 Activated carbon and biochar can be used for many things – alternative feed-stock for products in agricultural, waste-water, health and care product industries. In this case Germany requires tight regulations in the purification water plants primarily for the reduction of pharmaceutical residue in the water, so this plant produces high grade activated carbon which is used in the water filtration system of the town’s water supply located next to the facility. The third day was followed by a conference – Smart Use of Biomass for Alternative Carbon Products We had strong speakers from the University of Kassel, Dr Michael Wachendorf who elaborated on the RE-DIRECT project and Dr Frank Hensgen spoke about the technical feasibility and ecological sustainability of developing a market for activated carbon and biochar. 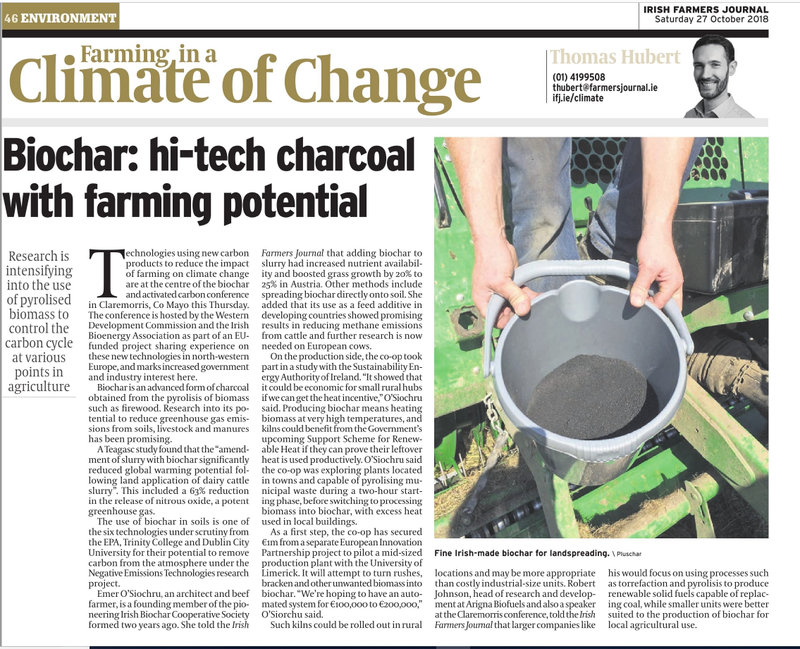 Dr Nikolas Hageman from Ithaka Institute which is a centre for collaboration on all things that are carbon related spoke about finding carbon intelligent solutions, the Institute is known for its expertise in production, post-production treatment and use of biochar. The Irish Partners – Western Development Commission were represented by Clodagh Barry who spoke about the economic investment potential in the region of Ireland. The day was wrapped up with discussion groups around building markets and developing awareness, all in all it was a productive few days of knowledge sharing and network building, certainly our Irish delegates who came to the conference seemed to feel they got a lot out of the event both in terms of meeting people and understanding the market place. 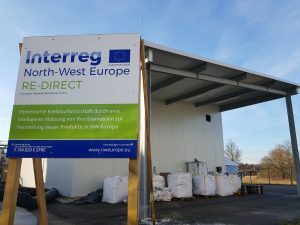 The Irish BioEnergy Association (IrBEA) and the Western Development Commission (WDC) are the Irish partners in the Interreg North West European project called RE-DIRECT . This project supports turning waste, low value or residual biomass into high value carbon products such as Biochar and Activated Carbon. The vision is to establish regional hubs where biomass from the surrounding areas can be converted into biochar or activated carbon. These are charcoal-like materials that are very porous with large internal surface areas and a high capacity to absorb contaminants. This makes them useful for a wide variety of applications ranging from waste water treatment to soil amendment and remediation, to gas cleaning. 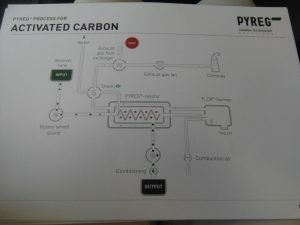 The innovative pyrolysis technology used can also produce a clean renewable fuel. The 11 project partners from RE-DIRECT are from Belgium, UK, France, Wales, Germany and Ireland. This technology has been developed at a pilot site at the Baden-Baden City’s Environmental Division in Germany and under this project a 20,000 t/year plant will be built to assist the filtration of the municipal water. In Wales last week a IFBB (integrated generation of solid fuel and biogas from biomass) plant has arrived from Scotland and delivered to our Welsh Partners at Cwn Harry Trust to be installed on their farm site.